- If you missed it at the top of the page, view visitor's pictures! To view pictures currently stored in the Members' album, please click here! Welcome to our members' photo gallery. Here, members of the Piscatorial Pursuits' Outdoor Forums have the ability to upload their own images onto our site for a variety of uses. Whether you simply wish to share your successes, or perhaps would like to add a picture to your posts on our Bulletin Board, or maybe you would like a custom avatar on the board? 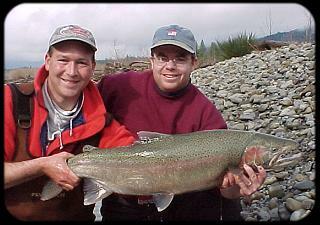 Not a bad first ever steelhead for Wayne, it's always fun to share those memories! We'll also choose random pictures every few weeks and display them on our homepage! You can do all of the above via the uploader! Simply use the form below to upload files into storage. There are several categories you can choose from, so please place your picture within the appropriate category. PLEASE DO NOT USE THE UPLOADER TO STORE PICTURES FOR YOUR OWN WEBSITE TO BE SERVED FROM OUR SERVER OR WE WILL DELETE THE PICTURES WITHOUT NOTICE. File Sizes must be less than 104k. Use an image editor to resize / compress files larger than that. Files must be: .jpg, .gif, format. For Bulletin Board Use, please keep images smaller than 640 pixels in width. For avatar use, please try to keep images somewhere around 125 pixels square. When you upload your picture, you will be sent a confirmation email. This email will contain an address in the form of: http://www.piscatorialpursuits.com/uploads/UPXXXX.jpg . This is the address that you will use to 'call' this picture off of our server. Use it when filling out the Avatar selection box, or in the prompt box that opens when inserting an image on the Bulletin Board. Instructions: To Upload a File, Press the Browse Button on the form below. It will open a window in your browser, that will allow you to navigate on your hard drive, to where the File is located, select it and then press the Open button. The File will then appear in the File to Upload box above. When you are Satisfied, Press the Submit button and wait for a response! PLEASE WAIT UNTIL THE "SUCCESS" PAGE COMES UP - OR THE SCRIPT WILL NOT WORK! Notice: If you don't see a browse button, that means your browser is old and you have to type it in.